I've been spoilt with nice hotels recently. 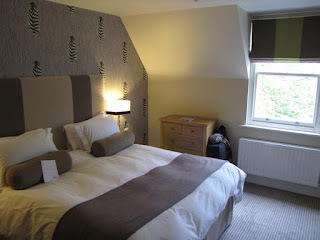 With Seaview in Laugharne, and St Brides in Saundersfoot, I became accustomed to beautiful rooms with plush bedding and bathrooms to die for. So it's just as well that, on a recent trip to Bournemouth, I was holed up in the Green House. 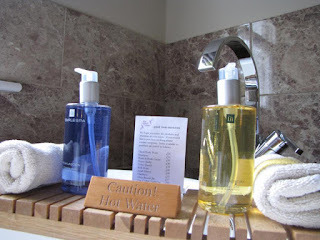 With impressive eco credentials, and a decor to die for, the Green House is everything I look for in a hotel. Honestly? I never really got my bearings in Bournemouth. I usually get around on foot, but on this trip a car arrived to take us from A to B each day, which was great, but it meant I didn't get a chance to have a good walk around. What I can tell you is the sandy beach is just a around the corner, so you can walk to the sea in no time. To walk to the centre of town would probably take around 5 or 10 minutes. My room was beautiful. The walls were Farrow and Ball (who are based just around the corner, incidentally) and the palette was muted and calm. The bed was kitted out with lovely soft sheets (all organic cotton) with natural blankets and bolsters. 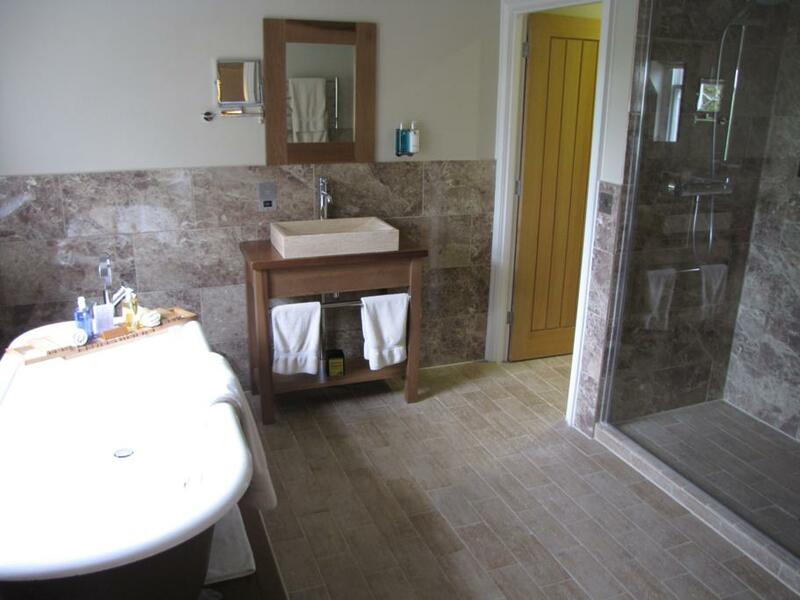 In some rooms, a roll top bath sits in the middle of the room, but I had a separate bathroom, which was huge. 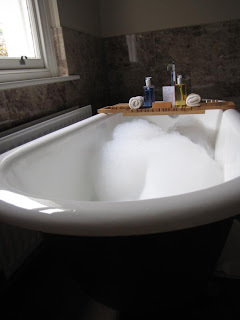 The bath was the best I've ever been in. I'm on the tall side, so I quite often don't fit comfortably in a tub. 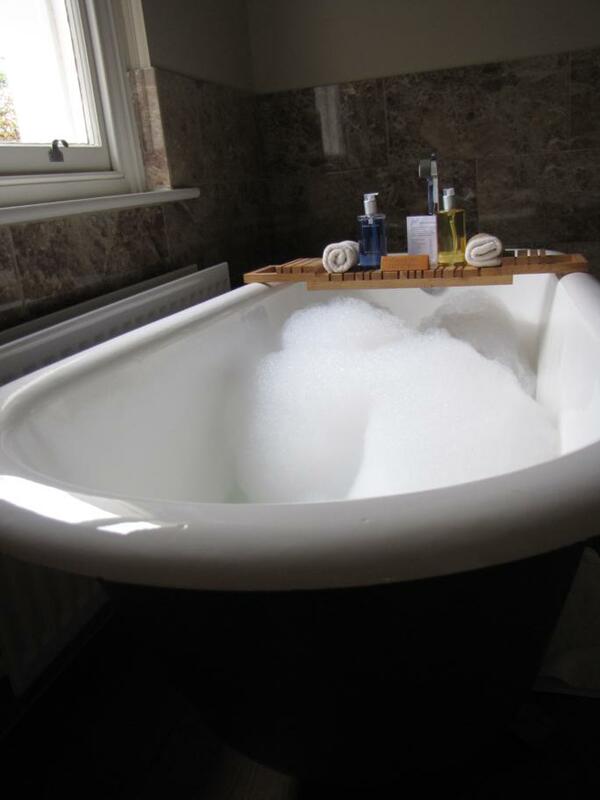 But this was big enough for me to stretch out completely, which I did happily, surrounded by Temple Spa bath bubbles. There was also a huge shower, and a separate toilet. I kept things light on the first morning I was there, but went all out on the second. To start, a table was filled with fresh fruit, cereals, yoghurt and mini pastries. Fresh tea and coffee was brought to my table when I sat down, along with a shot glass of fresh smoothie, which was a nice touch. There was a selection of hot breakfast options (though my favourite pancakes were not on the menu) and I went for the New Forest full breakfast. The Green House care about food provenance, and they're not all talk. Mushrooms are foraged by local legend Mrs T, and all meat is locally produced. On my first evening there, I ate in their restaurant, where we had a 25 mile menu (everything was produced within 25 miles of the hotel). It was delectable. Even the wines were all locally produced. There was always someone at the reception desk, and they were helpful and smiley whenever I dealt with them, as were the waiting staff. Oh, and the cleaner who I bumped into in the morning was just as happy and smiley, which was reassuring. Double rooms start at £140 for a small double. The master double, where I stayed, is £240. Pricey, yes, but the perfect spot for a treat. There are special offers listed on their website, where you can also find deals for dinner, bed and breakfast. I'd go for that - for a midweek stay for two, the price is £155, which is amazing value. You can upgrade to the bigger room for an extra £30.